Did you miss my recent announcement? Missing Unicorns didn’t. Recently I mentioned I was “between startups”, a situation that lasted five days. From my experience of hiring this is an all too common occurrence. By the time you hear that someone is looking for work they’re already gone – the situation is almost as bad as flat hunting in London. Demand for anyone attached to startups, especially developers and designers, in London is extremely competitive which makes recruitment a constant battle. With the competitive nature of the market it’s extremely important to be on the ball and act quickly when people become available. The role of a great in-house recruiter can help with this, building relationships talent who could potentially fit the criteria of the team. Having this person also gives the company an unfair advantage as they’re in the perfect position to identify subtle hints that a person might be considering leaving their current role. In my scenario there were two key updates that reflected my new position before the blog post. The first change I made was to update my twitter bio to be more generic. While someone changing their twitter bio doesn’t mean they’re looking for a new role, it could be an early indication of someone getting their house in order. The second change I made was updating my LinkedIn profile. With this a good recruiter / company had 3-4 days lead time before it was common knowledge. However expecting a person to identify these subtle changes is unrealistic. This is where Missing Unicorns saves the day. At the heart is a system watching for these types of changes, these tweaks and early indications that someone is getting ready to move on. If you’ve indicated they could be a potential hire, when we detect certain changes then we’ll alert you via email. This alert allows you to start being ahead of your competition instead of missing out. I’m back from SXSW 2014… What’s next? Contracting? Maybe, let’s find out! Not for the first time I find myself in the position of being “between startups”. I’m happy, which for some might be surprising, as I’m really keen to push into new areas and explore more about what life has to offer. While exploring the question about “what’s next?”, I need a contracting role. While I don’t see contracting as being a long term activity, I need to be realistic about paying rent etc. Contracting has the added bonus of being a great way to work with other companies and people. My coding background is a combination of C#, Ruby and NodeJS but the team and projects are far more important to me than the technical stack. 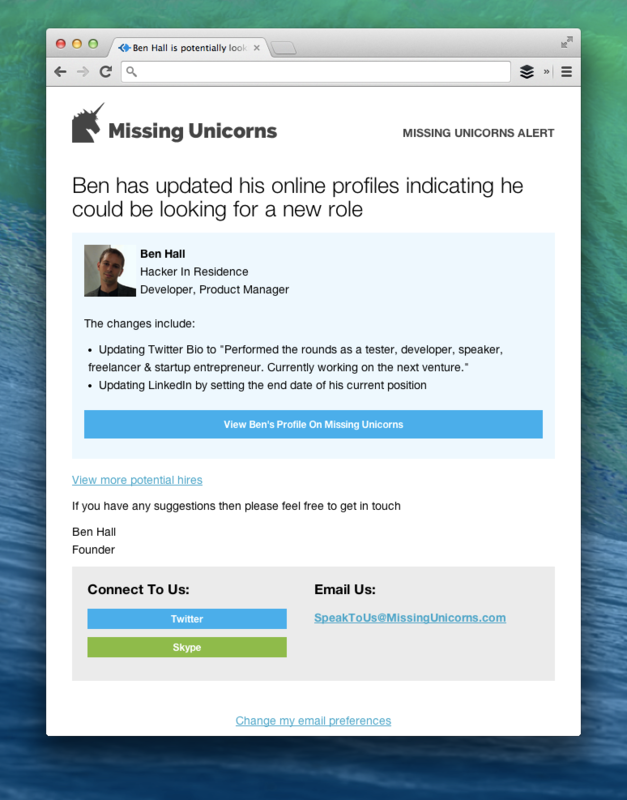 A role focusing on products would be great but not essential, if it involved non-coding aspects then even better! I’m passionate about coding but a break is something welcomed. I’ve worked with mobile before and while I wouldn’t call myself a guru I would relish the opportunity to explore this in greater detail. London works for me but I would love to see other places! I am honestly open to suggestions! If you would like to chat then Twitter (@Ben_Hall) or Email ([email protected]) are best. If I’m contracting and have somewhere nice to stay then I want to use this opportunity to do something good and help other startups. Rob Ashton was 100% committed to this and you have to admire his approach to life. I’ll cover this in more depth in a future post but I definitely want to start giving back and providing more help where I can. I used to love helping others but recently I haven’t created the opportunity to do so. If you fancy breakfast or a coffee then let me know. Alternatively chances are you’ll see me at events like Silicon Drinkabout where we can chat over a beer. While I’m not sure 100% sure what I’m working on next, the one thing I am sure about is that I’m grateful for the opportunities given to me by the previous companies and the people I’ve worked with such as Red Gate, 7digital, Springboard (especially @jd and @jessinblue as they helped me make the big jump into startup life), Swapit/SuperAwesome and 1seed. With that, it’s time to open a new moleskin notebook, grab a new pen and start the next chapter. While waiting for a contract I have some ideas in the pipeline that I want to explore, experiment and in/validate. If you’re interested in hearing more then subscribe to the mailing list below.